Just over 100 years old, the University of Texas at El Paso (UTEP) is a burgeoning national and international research university committed to access and excellence. A leader among minority-serving institutions, UTEP enrolls over 25,000 students with a large bilingual population. UTEP is designated by the Carnegie Foundation for the Advancement of Teaching as “Community Engaged,” and UTEP faculty have been nationally recognized for their commitment to student success, teaching, research, and scholarship. As a center for intellectual capital, UTEP has awarded more than 110,000 degrees since its founding in 1914 and is one of the major economic engines in the Paso Del Norte region. El Paso and UTEP lie within one of the most spectacular settings in North America that have something for everyone. The rugged landscapes of the southern Rio Grande rift range from semi-arid deserts to alpine tundra. Located at the southern end of the Rio Grande rift, active tectonism has exposed strata ranging from Proterozoic through the Quaternary. Intrusive and extrusive igneous rocks also range from the mantle peridotites of Kilbourne Hole to thrust involved andesite stocks. Pennsylvanian and Early Tertiary deformation events are spaced by Mid- Cretaceous and Recent rifting, with all the structures beautifully exposed within 50 miles of El Paso. Classic geologic localities of Carlsbad Caverns, the Sacramento Escarpment, and the Guadalupe Reef are 100 miles from the University. From an environmental perspective, the 2.5 million people in the metropolitan areas of El Paso and Juarez Mexico have numerous needs and provide opportunities for outreach and research. The Department of Geological Sciences was the first at UTEP to be given Ph.D.-granting status. The region’s long association with mining (We are the Miners!) and excellent geological location have ensured the department a high-profile position within the university since being founded as the Texas School of Mines, then as Texas Western College, until today as part of the University of Texas system. With a diverse faculty of 20, the department continues a tradition of strong fundamentals and field work combined with advanced analytical and computational methods. We thrive and excel at interdisciplinary research and education working with Biology, Chemistry, Physics, Mathematics, Health Sciences, Computer Sciences and other disciplines. Our mission is to provide experiential education to our undergraduate and graduate students to propel them into diverse careers in industry, government, non-governmental organizations, and academia. With majors in Geological Sciences, Geophysics and Environmental Science, a degree with us can lead to numerous career options. The Department of Geological Sciences has instituted a program of team-oriented, project research starting with Physical Geology for majors. We have begun organizing peer-to-peer learning to facilitate interactions among all levels of students. In addition, UTEP Geological Sciences is a national leader in transitioning community college and early college high school students into the B.S. degree. Our faculty incorporate undergraduates into our graduate student-centered research to make the most of the learning experience while producing world-class research publications. 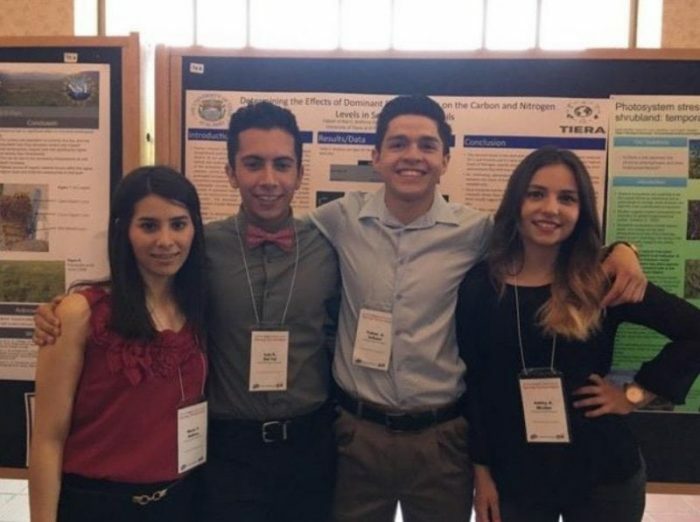 Environmental Science students from ESCI 2105 (from left to right: Nuria Andreu Garcia, Luis Del Val, Fabian Uribarri, Ashley Macfee) presented posters on their research projects at the Campus Office of Undergraduate Research Initiatives (COURI) symposium in 2016. Research and graduate education are organized into six themes: Entrepreneurial Geoscience, Earth System Geochemistry, Geospatial Research, Science Learning & Education, Solid Earth & Geophysics, and Tectonics and Sedimentation. Themes help ensure that we have strength and breadth in critical areas and create an integrated curriculum and research experience. The themes interact whenever possible with a collegial faculty that is always looking for opportunities to collaborate. In addition, we have started to grow in hydro(geo)logy with the addition of Hugo Gutierrez-Jurado who studies the relationship between groundwater and vegetation in arid regions. Hugo’s work couples well with the plant ecology group in Biology at UTEP. To complement this expertise in macro-biota, Jie Xu joined the faculty in 2016 as well. Her research focuses on nanoparticles in the environment and how microbes form these highly reactive phases. Both of these research areas, hydrogeology, and biogeochemistry, are set to become research theme areas in the near future. High-resolution transmission electron microscopy (HR-TEM) of biogenic metal sulfide nanocrystals (Image courtesy of Jie Xu). Entrepreneurial Geoscience is a theme that the world needs now more than ever. In a time where demands on energy and mineral resources skyrocket, we investigate new avenues to anticipate these needs as well as preparing students with entrepreneurial skills to address the challenges of geologic discovery and economic development. 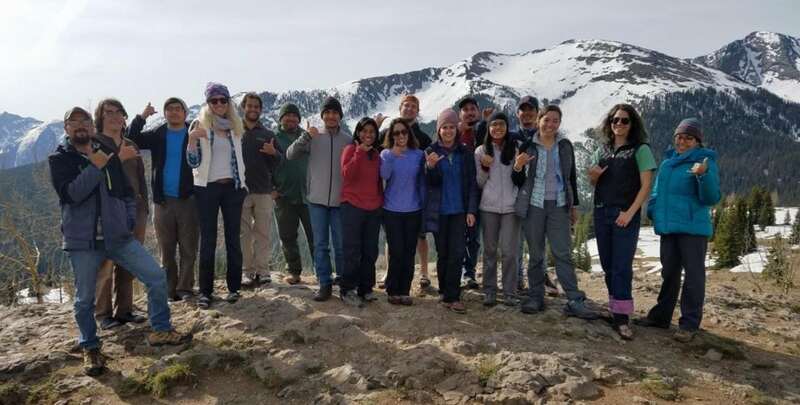 Led by Phil Goodell and assisted by Roshelly Paliza, the Center for Entrepreneurial Geosciences is producing a new generation of entrepreneurial geoscientists. These individuals will become leaders because of their ability to connect geological and environmental science with the skill to generate business opportunities. Combined with the new Fast Track to MBA through Geological Sciences, we ensure students have access to an education leading to successful business careers. Society and the natural world are intertwined through the chemistry of the Earth system. The Earth System Geochemistry (ESG) theme uses science to learn how civilization and the natural environment can be sustainably managed. From rocks to humans, from dust to soil microbes, and from trace elements to regional water budgets, ESG spans a mind-boggling diversity and variety of processes that operate from picoseconds to eons. Despite this range of spatial and temporal scales, all of these processes and their interrelationships must be understood in an integrated manner. Geochemistry is a key to finding common ground to address this grand challenge. Consisting of Drs. Libby Anthony, Gail Arnold, Benjamin Brunner, Diane Doser, Hugo Gutierrez-Jurado, Tom Gill, Phil Goodell, Lixin Jin, James Kubicki, Lin Ma, Jason Ricketts, Nick Pingitore, and Jie Xu, the ESG group has the knowledge and techniques to tackle complex Earth System issues both in the classroom and in research. We reiterate our strong collaborations with others, especially environmental scientists in biology, chemistry and the Center for Environmental Resources Management (CERM – Dr. William Hargrove, Director), to further expand the number of approaches we can use to educate students and guide them through research. 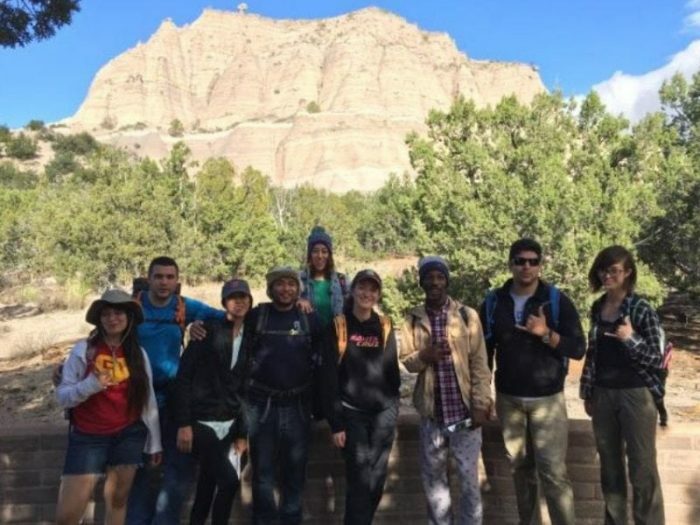 AY-PREP student research trip to central New Mexico 2016 at Tent Rock monument. (L-R) Paola Soto-Montero, Mark Hathazi, Aide Huerta, Jonathan Lucero, Mercedes Navarro-O’Hara, Guadeloupe Alvarez Rodriguez, Kofoworola Fadeyi, Alan Jacquez, Vanessa Apodaca. One of the fastest growing job markets is in Geospatial Research. The founder of UTEP’s Geographic Information Systems (GIS) program, Dr. Deana Pennington with Drs. Tom Gill, Jose Hurtado, Richard (Rip) Langford, Stanley Mubako, Terry Pavlis, Nick Pingitore and Hugo Gutierrez-Jurado are working to shape changes in dealing with problems such as water management, spreading disease and dust storms. Field geology is being revolutionized by mobile computing technologies and UTEP is at the forefront of this effort (e.g., Pavlis et al., 2010; Pavlis and Mason, 2017). We are honing our field data collection systems to include live, 3-D mapping through the construction of 3-D surface models from LiDAR and photogrammetry. Drones are at the forefront of this research and are used to obtain rapid surveys to create high-resolution digital elevation maps (DEMs). Students are using drone technology to produce groundbreaking research and learning to build drones under the leadership of Dr. Laura Serpa. This exciting and practical 21st-century research also leads to potential entrepreneurship opportunities because the GIS approach is utilized in commercial endeavors at a rapidly growing rate. The U.S. Department of Labor identifies geospatial technology as a high-growth, high-demand, and economically vital sector of our economy. Our vision is to be the cutting edge in GIS while producing young professionals with a 21 century demographic. 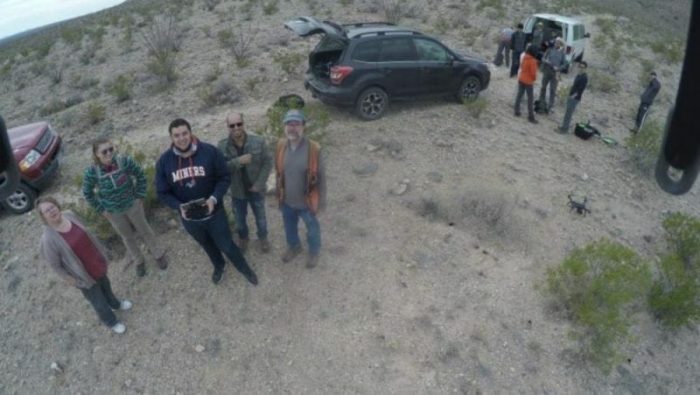 Image was taken from drone of field work by left to right: Dr. Laura Serpa, Kate Grisi, Jose Cervantes, Jose Garcia, Dr. Terry Pavlis. UTEP Geological Sciences balances the demands of advanced research and educating students by merging the two efforts into one. The Science and Learning Education (SLE) theme works to ensure that we are constantly examining and improving our pedagogical methods. Research on how students learn science is improving our students’ preparation and professionalism and subsequently their career opportunities. Our research on science education is widely recognized for developing new and better ways to teach science concepts and skills so students learn more efficiently and deeply. Problem-based learning, collaborative and networked learning, and peer-to-peer team learning are approaches that have demonstrated efficacy in teaching science. We are involved in a variety of projects targeted toward challenges specific to groups currently under-represented in scientific fields. Our mission is to target key research areas that have been shown to improve student recruitment, retention, and graduation rates. We develop research projects in these areas and test our findings in classes and outreach activities. These areas include K-16 pathways to success, minority education through travel, and collaborative and networked learning. All faculty benefit from the knowledge gained by the SLE theme, but the leaders are Drs. Diane Doser, Tom Gill, Phil Goodell, Terry Pavlis, Deana Pennington, Laura Serpa, and Aaron Velasco along with an excellent collaborator at El Paso Community College – Dean Joshua Villalobos. Solid Earth & Geophysics focuses on the Earth from crust to the core using techniques ranging from remote sensing to geophysical imaging. We specialize in active deformation determined from seismology (both controlled source and earthquakes), paleoseismology, potential field geophysics, and satellite-based measurements. Controlled source experiments are enabled by the National Seismic Source Facility housed within our department and run by Galen Kaip and Steve Harder. Specific research projects include earthquake hazards in our region, forearc deformation in Alaska, seismo-tectonic characterization of the Himalayan Fold-Thrust Belt, dynamic earthquake triggering, and development of 3-D models from multiple geophysics datasets. The last area, in particular, is an opportunity to collaborate with Computer Scientists through the CyberShare Center of Excellence and to connect the ESG group datasets to delineate complex aquifers. Future economic development in arid regions such as El Paso and Ciudad Juarez depends on the ability to manage water supplies as efficiently as possible, so knowledge of water sources and potential recharge areas is critical to our economic future. We have world-class scientists Drs. Diane Doser, Jose Hurtado, Marianne Karplus, Terry Pavlis, Laura Serpa and Aaron Velasco (recently selected as the State of Texas Chief Seismologist) working in Solid Earth & Geophysics and we look forward to hiring a new faculty member in the coming year. 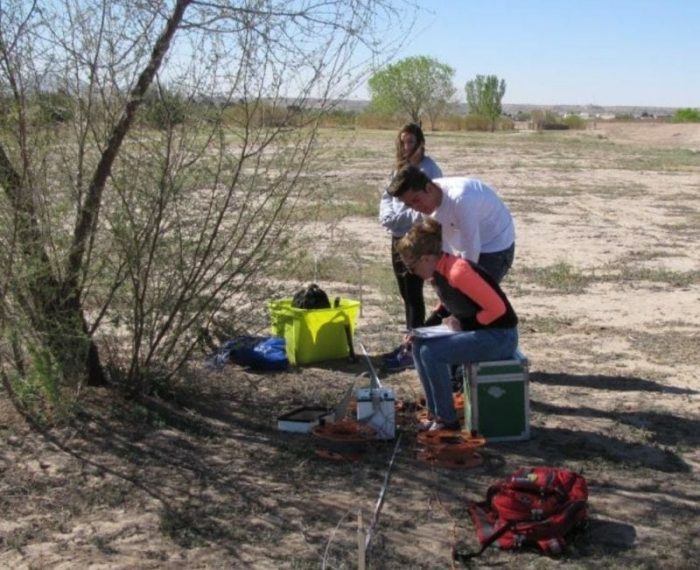 Freshman physical geology lab field trip collecting geophysical data near the Rio Grande River. Tectonics and Sedimentation are at the heart of Geological Sciences. This group consists of Drs. Gail Arnold, Benjamin Brunner, Kate Giles, Jose Hurtado, Rip Langford, Terry Pavlis, Jason Ricketts and Laura Serpa. These world-renown scientists decipher the feedbacks among tectonics, erosion, and sedimentation to gain a quantitative understanding of deformation, erosion and sediment dynamics that write the story of Earth’s history and lead to the state of the planet’s surface we now live on. To address the important questions in the field, we develop hypotheses from observations that are shared with all team members who cover a broad range of expertise. This allows us to find new, creative and efficient methods to test and refine hypotheses and move forward the cutting edge of Geological Sciences. Projects include unraveling the mixing of mélange, inverted basins and out-of-sequence thrusts, syntectonic rift sedimentation, and salt-sediment interactions. The last of these coalesce through the Institute of Tectonic Studies direct by Kate Giles which includes a highly successful academic-industry consortium. In addition, we utilize the Indio Mountains Research Station to allow our students access to world-class exposures of sediments and tectonic features that are unique analogs to oil fields such as those in Brazil. In summary, UTEP Geological Sciences is a department designed to maximize collaborations both internally and externally. We are addressing regional problems related to the availability of water and the effects on soils and plants, as well as global problems in earthquake hazards. From freshman year to Ph.D. graduate, we seek to provide an interdisciplinary education for our students based on field and hands-on research experience. Our faculty work with other departments from across campus to provide the most flexible and comprehensive curriculum possible.